Books are such a great gift for all ages. Even if you don’t have a reader in the family, there is coloring and activities, plus journals and bibles are wonderful too. Today I’m sharing some new titles that will be sure to be added to your Wish List. YES: Transform Your Life with Color-by-Number by Trey Speegle, America’s #1 paint-by-number pop artist, and published by Regan Arts. Just came out yesterday! It is unlike any other coloring book because it’s an artistic collaboration. 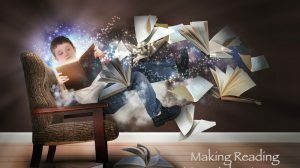 A way to tap into your own imagination and create unique works of art, in a way that is fun, relaxing, and fulfilling. I can’t draw or paint worth a darn, but after coloring one of these pages I feel like I can! Pick Me Up by Adam J. Kurtz, graphic designer, develops this engaging journal for anyone who loves to explore ideas, record thoughts and feelings, and capture those fleeting but amazing moments of everyday life. A great stress reliever to make you smile – pick it up again and again! Start Where You Are by Meera Lee Patel is a gorgeous, hand-painted journal that presents supportive prompts and exercises along with inspirational quotes to encourage reflection through writing, drawing, chart-making, and more. Get your creative juices and spiritual potential flowing! NIV Wonders of Creation Holy Bible for ages 8 and up. 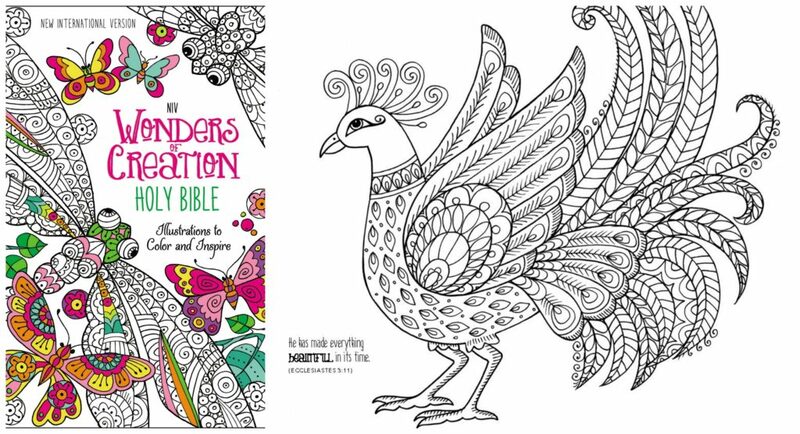 From amazing Eden-esque gardens to the creatures God made, this Bible features over 50 ready-to-color pages alongside the full text. LOVE! The Lord’s Prayer: Words of Hope and Happiness by Rick Warren and flowing illustrations by award-winning artist Richard Jesse Watson. A lovely children’s book using scripture to help familiarize children with real biblical text while also presenting contemporary illustrations and insightful words that make this beautiful prayer come alive. The Berenstain Bears Christmas Fun Sticker & Activity Book features Papa, Mama, Brother, Sister, and Honey and the rest of the Bear Country gang. Help Honey Bear find the missing piece of the Bear family Nativity scene, do crosswords and word searches with Brother and Sister and even help out at the Christmas Eve service at Chapel in the Woods. 50 reusable sitckers make it even more fun! Six National Geographic Kids Books – new titles! For kids approx 7-12 years old. How Things Work where you can discover the secrets and science behind bounce houses, hovercraft, robotics and everything in between in this book that provides both the quick answers AND complete explanations for all things high tech, low tech and no tech (how DOES glue work???). Ultimate Oceanpedia is overflowing with amazing facts, photos, art and diagrams that take the reader on a journey through the ocean. Whales, dolphins, porpoises, turtles, sharks, fish, crustaceans, sponges — from the weird to the wonderful — they are all featured in breathtaking photographs with easy to read captions. Tales From the Arabian Nights: Stories of Adventure, Magic, Love, and Betrayal are classic stories and dazzling illustrations of princesses, kings, sailors and genies come to life in a stunning retelling of the Arabian folk tales from One Thousand and One Nights and other collections, including those of Alladin, Sinbad the Sailor, and Ali Baba and the Forty Thieves. The Book of Heroines are true stories of superstars, war heroes, world leaders, ladies in lab coats ad everyday people who all have two things in common — they were girls and they changed the world. From Michelle Obama, Jane Goodall and Wonder Woman to Susan B. Anthony, Gloria Steinem and Katie Ledecky, The Book of Heroines not only highlights how girls are just as tough as boys, but also challenges the reader to be a heroine herself and provides tips on how to unleash her inner heroine. The Book of Heroes features a very diverse array of amazing minds, heroes from history, sports stars and even action heroes — like Abraham Lincoln, Mark Zuckerberg, Stephen Hawking and Steve Irwin — boys will be sure to find more than just a few role models in the pages of this book and also perhaps inspire them that they, too, are capable of extraordinary things. 5,000 Awesome Facts About Everything 3 features gross facts about toilets and edible insects, gravity defying facts about things that fly, awesome new dino-discoveries and even facts about newborn octopi and how many oranges it takes to make one glass of o.j. — to name just a few! This book is the ultimate boredom buster and is perfect for curious kids who love to learn about the weird, wild and wacky! 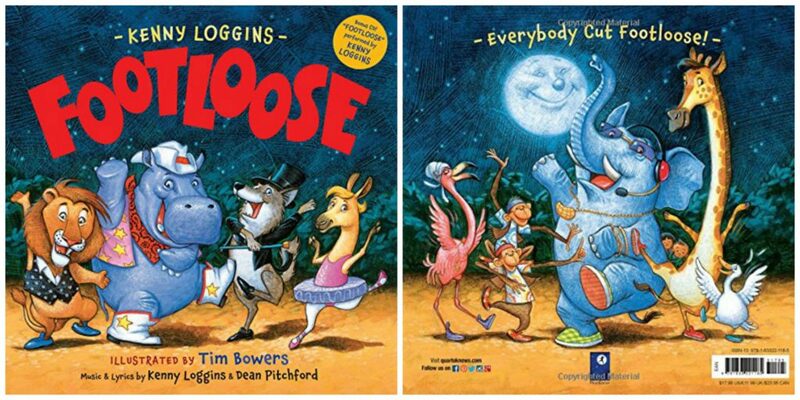 Footloose by Kenny Loggins and cute illustrations by Tim Bowers. Time to cut loose! A new story rewritten for kids ages 4-7. As a zookeeper named Jack joins the zoo animals in an all-night dance party will get your feet moving. To add to the fun, the book includes a CD with new recordings by Kenny Loggins! YES! So cute!! Did you find some books to add to your Wish List? I partnered with these publishers for this post and links may be affiliate. All opinions are my own. This giveaway will end on November 23, 2016 at midnight MST. Winners will be drawn via rafflecopter. Once a winner is drawn I will contact them and they will have 48 hours to reply before I draw a new winner. Giveaway is open to anyone in US and you must be 18 years of age or older. Giveaway not affiliated with Facebook & I release them of liability. Winner will be posted in the rafflecopter widget. My daughter would love these !She loves books ! I love giving books as gifts, my kids always love receiving them too. I gift books a lot. I have quite a few people who love to read on my list. I LOVE books. The kids always get books throughout the year, and they get them at Christmas. Great gifts. My grand daughter just started reading so some of these would work great for her! I do gift books! Kids get so many toys these days, books are a nice alternative! I love books! My favorite is Where the Red Fern Grows! As a single working Mama of 3, I often gift books as fun, simple, and inexpensive presents for my family and friends! I love to give and receive books. I enjoy reading them and reading them to my grandchildren. Yes, I give books all the time, I have grandchildren and daughters, that love to read. I am already making my Christmas lists of books I want to give this year! Yes...I like to give books as gifts! I do gift books. I put romance novels in my mom and aunt's stockings at Christmas. I just gave my son a family bible for his wedding. I've got grandsons I've given books to also. Books make the best gifts! I love some of the titles in this collection especially the national geographic books! I love book and my 14 month old loves them too. I'd like to get him lots of Christmas books for the holidays. I like to give books for a gift. We love books and enjoy giving them as gifts. Its nice to unplug from electronics and cozy in with some stories. I love to gift books to my grandsons! They get so excited to read something new. I think they would really like to have the The Berenstain Bears Christmas Fun Sticker & Activity Book! I love books, I love to read, and I love to give books as gifts. I bought my brother two books for Christmas he asked for. I like books but haven't read one in a while. I would like to have "How Things Work" to read for myself and to educate the kids who are forever asking questions, some of which I don't have an answer. I am happy they are thirsty for knowledge. I also like the book about women heroines. We adore books of all kinds. We do gift them especially to the Grands. This is a wonderful prize. Thanks you for hosting this great giveaway! I like to give books as gifts, especially to the younger relatives. I just had a book come today for a loved one for the holidays. I love to read and give books especially to the kids in the family and these titles look interesting too. My daughter loves new books. The Footloose books looks so cute. I am a fan of the movie. Giving books as gifts is always good! I would love to share FootLoose by Kenny Loggins with my grandsons. I have always given book as gifts to my kids and my siblings kids. I give books to people for Christmas every year. I love to read! I gift children's books to my young grandaughter. Sometimes we do - depends on who we are giving to! I see several that dd would enjoy in there! Yes. I gift books! Any books I can I like to donate to the church for the kids. Every Christmas I give my four grandchildren a toy, something to wear and a book. I'm always looking for great books to give them! Yes, books are a must. My boys are both getting books for Christmas, but these are some great ones to add to their collections. We follow the rule something you want something you need something to wear something to read when it comes to gift giving. I would be really excited to read pick me up. I would also love reading footloose to my daughter! Growing up my kids knew they would always get at least one book at Christmas. I still practice this when buying for others. We love giving books to our nieces and nephews for Christmas! I would love to have Start Where You Are. I always gift books to my dad. YES I love books, so I would buy gift books. When they want a very special book... I will buy it. You know what however, I can't afford new books. Second hand rocks. I hope I win these! I AM SERIOUSLY THE BOOK GIFTER! I LOVE, LOVE, LOVE TO GIVE BOOKS AS GIFTS! I THINK THEY ARE UNIQUE TO EACH PERSON, FUN AND EDUCATIONAL! We give books all the time. We have cultivated a family of book lovers. I never gifted books, but it's a great idea! I think books are an essential gift! I love giving books as gifts. I always get each of my children one new book for the holidays. I like the selection offered. I love books for myself, but I also gift them. The kids books in this lot would make wonderful gifts. Thank you for the giveaway. Books are such a blessing! I love to gift books! I also love to buy my daughter books since she can read now and is my little bookworm! Fun books are always a great gift. These are some fun ones! I love to gift books to my oldest daughter and nephew...it's something they enjoy while learning at the same time. I love gifting books to my family. Yes, I love gifting books. My whole family would love this prize pack. I love books and they are one of my favorite gifts to give! I have bought people books before, usually my mom. I love to gift books to kids! I gift books! We have a big collection, too. I give books to my 4 year old's friends for their birthdays. Books are my favorite thing t gift to my granddaughter. Now that she is learning to read it is even more fun. I will be adding the Footloose book by Kenny Loggins to my wishlist. I gift books all the time and I love when I am gifted books as well! These look like some enjoyable titles too. We come from a long line of teachers, so books have always been a big part of our lives. We love books in my family and I think they make great gifts. My nieces and nephews would love those National Geographic books! I love to read and give books! I see some great gifts! And I love the color by number book, I can't draw either! I love to give my grand kids books! I especially like the National Geographic books. Yes we gift books! My kids love to read and they always will get a new book for birthdays and Christmas. I give books as presents a lot. We all love to read here. Thank you for the chance to get more reading in. Books are such a great gift! I do give books as gifts especially seeing I'm in a book club that meets monthly. This would be fabulous to win! Reading is a hobby of mine and yes giving books as presents is WONDERFUL! There's nothing like some quiet time with a good book. They are great items for gift giving indeed. Great books. I have a 2 year old niece who is really into books, much to all of our pleasure. About to pick up a book here myself. I love gifting books, and this set has some great ones to give..and to keep! Sometimes I do.If I know the child loves to read. I love to give books for gifts. And I really love to receive them! Any of the books in the blog post would make a nice gift. Love gifting books! And my kids all love to read! We LOVE to gift books... and receive them too! I love reading and so do my kids! We have several books on our Christmas list this year! I'm also giving books to the nieces and nephews this year as well. This collection is a great assortment where there is something for everyone on my list! Yes, we gift books for the holidays! we all gift books because we all love books! We love giving and getting books. The National Geographic books look like they'd be fascinating! I always give my 6 grandchildren books for Christmas/birthdays, etc. I love to read and hope they will get the same love as I have. Yes there are a lot of titles they do not have yet. I love gifting books and these all look great. I like the journal and the coloring books. My daughter loves the Berinstein Bears! I love to give books as gifts to my grandson. yes!! books are loved around here and librarian grandma always brings books for gifts and we love it! Lots of great titles. I loved The Berentstain Bears when I was a kid! I'd love that book for my daughter. We would have so much fun together. Great giveaway, thank you! My Granddaughter would love these books! Something for everyone in those 13 books thanks so much! books are a great gift! Yes I love to gift books! My daughter would love the National Geographic ones! I definitely gift books - every Christmas when my kids were younger, there was always a "book box" gift and now that I have grandbebes, THEY get a "book box" gift. 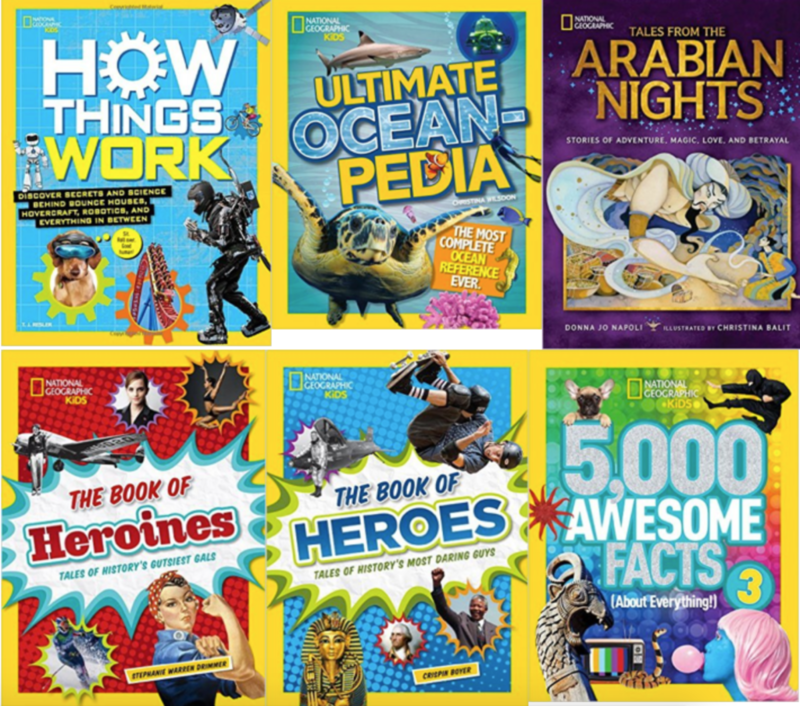 I'm definitely going to look into the NatGeo Heroes/Heroines and Fun Facts books to add to their Christmas book box! I like to give recipe books to family. I do gift books, to my grandchildren, my oldest granddaughter loves to read and she always gets books about animals!